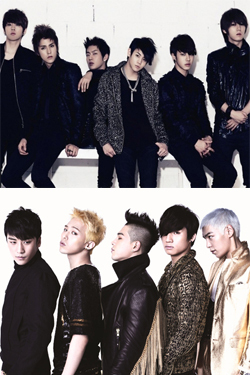 Idol group Beast has broken records in Japan set by the "untouchable" group, Big Bang. According to Oricon Style's homepage on March 22nd, "Beast's debut single "Shock" has sold about 29,000 copies in just one week, ranking them second on the Oricon Daily charts". This is even better than the group Big Bang who ranked third on the same chart in June of 2009 with their debut single "My Heaven". That was the best record set until now; for one year and nine months. Beast's new record is the best of any foreign Asian artist. Beast had planned on releasing their debut album, following that up with active promotions and a concert. However, with the recent earthquake, plans have been put on the back burner for now. After completing their first two headlining concerts in Korea, each of the members are currently focusing on individual activities.